(W) James Tynion IV (A/CA) Freddie Williams II. DC Comics and IDW team up for the crossover you never saw coming as two of the greatest entertainment icons meet for the first time! In Gotham City, a series of deadly raids leads Batman to believe hes up against a group of highly trained ninjas known as the Foot Clan! Somehow, they have crossed over to another dimension and are determined to take advantage of the situation while looking to get back home. But they haven't come alone: Leonardo, Raphael, Donatello and Michelangelo are hot on their trail. Get ready for excitement as heroes and villains from both worlds clash and team up in an epic battle that threatens the very fabric of reality! 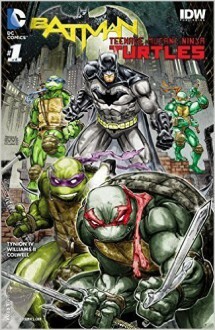 Batman/Teenage Mutant Ninja Turtles #1 is a great setup for the series. I can't wait to read what happens next.